What does Turner Enterprises, Inc. do? Turner Enterprises, Inc. (TEI), a private company, manages the business interests, land holdings and investments of Ted Turner, including the oversight of two million acres in nine states and in Argentina, and more than 51,000 bison. 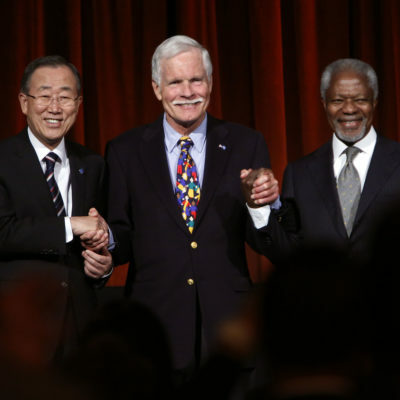 TEI also works closely with Ted Turner’s philanthropic and charitable interests, including the founding and ongoing operations of the Ted Turner Reserves, United Nations Foundation, Nuclear Threat Initiative, Turner Foundation, Captain Planet Foundation and the Turner Endangered Species Fund. Based in Atlanta, Turner Enterprises shares its building headquarters with Ted’s Montana Grill restaurant chain and the Ted Turner Reserves hospitality brand. When was Turner Enterprises, Inc. created? TEI was created in 1976. Is Turner Enterprises, Inc. affiliated with Turner Broadcasting System, Inc.? No, TEI is not affiliated with Turner Broadcasting System, Inc. or its parent company, Time Warner Inc.
How many honorary degrees does Mr. Turner have? Mr. Turner currently has 48 honorary degrees from such institutions as Brown University (Providence, R.I.), Morehouse College (Atlanta, Ga.), The Citadel (Charleston, S.C.) and Mississippi University for Women (Columbus, Miss.). What reading and/or video materials would Mr. Turner recommend? How old is Mr. Turner? Does he have any children? Mr. Turner is 80 years old. He was born in Cincinnati, Ohio, on November 19, 1938. He has five children (two daughters and three sons).